Family Guardian Angel Discounts Apply ! 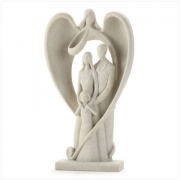 Featuring gracefully flowing, heart-shaped wings, this guardian angel forms a protective shield for a beautiful young family. Makes a wonderful gift for a new - or an established - family.